To give a visual I made this ‘mountain range’ based on what I have been working on at school. It is best understood like the journey of a marathon. Peaks and valleys are sharp some days you are coasting other days you swear you will quit or get left for dead on the side of the road without one of those nice people who will give you a cup of water! I am not certain what has been harder the mental or physical demand for certain it has been a complete workout or work over of mind and body! Once upon a time I used to be afraid to light the barbeque, not anymore. Many days I light the oxy-acetylene torch and track cutter at school, which I thought I would never feel okay about and then marvel at what I am doing. “It is unnatural”, one Instructor said, here we are banging metal, joining it, working with it and learning how to make a structurally sound weld. At UAPICBC there are 32 welding booths, well equipped with ample room for the welder and/or Instructor and even a couple of other students who may want to watch a demonstration. I was so happy to complete the SMAW (Shielded Metal Arc Welding) ‘family of bends’ and am now well on my way to completing the GMAW (Gas Metal Arc Welding) ‘family of bends’. Every welder who is working towards Level C must complete this and then go onto finish a CWB test and fulfill 1000 hours to obtain the ticket. Each one is like a trophy, a terrific amount of work goes into the ‘coupons’. Measuring, cutting, grinding, welding and grinding again. Only to pass or fail. I have not yet come up with what I will do with all of them when I am finished, maybe put them in the garden or make some sort of sculpture. I like the combination of science, functionality and creativity that exists in the trade. In the middle of the bend is the weld, which you can’t see. The welder who is successful will join two pieces of steel together making them one. Then you will go to the ‘heart breaker’, a press that tests the strength of the weld, aptly named by students and have it tested to see if it is structurally sound. It’s a pass or fail every time. Thankfully safety gear is the best it has ever been and is getting better all the time, after a while I get used to wearing all of the equipment, if I ever get lax and don’t want to or forget because I am in a hurry, one small accident will solve that, whether it is slag in the eye or a burn. First lessons learned: Safety, Setup and Comfort. 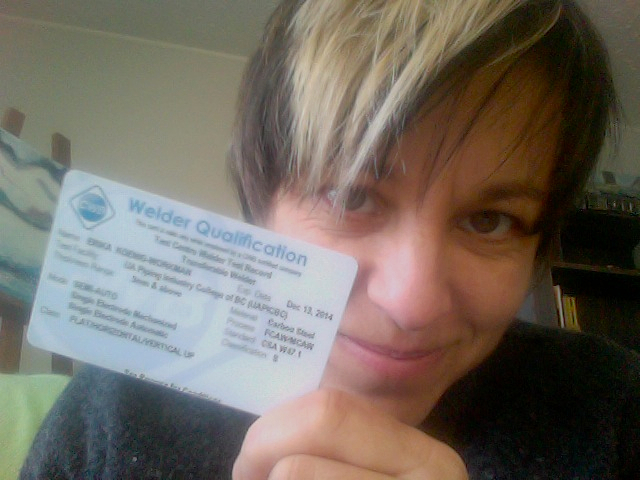 Carmen Electrode Blog Carmen Electrode Blog » Because Women Welders Rock!™. It is week three or four? ‘Arlette’ is tired. She is having her ‘soul’ replenished and renewed. Her steel tanks came first and then ‘Arlette’ built around them. Two large heavy fuel tanks that are ‘done’ ready for removal and replaced by custom made aluminum tanks that are built to hold the maximum amount of fuel for her. Heavy vs light, immoveable vs mobile, it is a natural progression to go to aluminum so she can live happily ever after. I wonder how it will lighten her load? Will she sail on easier and swifter than ever? Jim the boss man and Olie the whistling welder spear head the whole venture. It is a challenge that not many would take on. A very particular kind of job that requires a good amount of thinking and understanding about three-dimensional space accompanied by skill in fabricating and the physical and mental strength and fortitude to pull it off. My job is to assist, to make it easier. To pass the ‘surgeon’ a zip cutter, a light, to hold a pipe wrench, a tape measure then to clear the area of any debris and then change the zip disc. My child like curiosity gives me a buzz, to others I am an anomaly, a bit of a mystery. To break the stern silence of this ‘brutish’ occupation as Jim calls it, is part of my undertaking while I work. This realm is new territory for me and I like the challenge accompanied by discovery and adventure—it gives me new found energy to work really hard. The most important thing to me is that I remain willing to learn. Not in any particular order I am almost finished reading Eleven Minutes by Paulo Coehlo, while waiting for The Girl Who Kicked the Hornets Nest by Stieg Larsson to come out in paperback. Out on the coffee table is Metropolis (original short stories) Edited by John Scalzi, I read The Red in the Sky is our Blood by Elizabeth Bear an interesting primer to the film I saw the last week, The Greenhorns. Last but not least Captive by Donalda J. Reid, oh…. and I might have another go at The Life of Pi by Yann Martel because Colin Wright of ‘Blue Canoe and Galiano Island Inn Fame’, highly recommends it and because I am partial to Tigers, Ligers and Lions—well cats in general! I put books out hoping to pick them up in between working at two jobs and being with my boys. Add to this my modules on welding and I have my reading list for the rainy days ahead. I am telling you the truth when I write that often the sky out here is looking like a painting by J. M. W. Turner (1775-1881). I chose this one, The fighting Temeraire tugged to her last berth to be broken up painted in 1838 since it reminds me of industry that goes on out here (Steveston, on the Fraser River) everyday. Earlier this week, I was very excited to hear the news of Seaspan winning the $8 billion dollar contract to revitalize BC’s shipping industry. I am quietly hoping that there will be a place for me to weld too. Weather I work as a union or non-union welder, I am thinking there will be a few more women who will have their work cut out for them weather it be aluminum or steel. Though I haven’t seen any battle ships lately a few months back the tall ships were in town for a three-day weekend and it was a dramatic display from my studio balcony. I quickly sketched out with chalk pastel my view of the ships from the balcony. It was romantic moment and in the early days of summer when the air is warm and inviting —plein air, which always feels such a luxury and something I have yet to enjoy more of. Continuing on with View from Studio 217 VI. What drew me to the place I live is the light, the south east-west exposure and the spectacular changing face of Garry Point. On this rainy October day the greens are greener and the snow geese come and go flying their familiar formation while each day, Oliver at Action Welding, runs out to watch while Jim and I smile at his childlike joy of seeing the birds that remind him of his homeland.